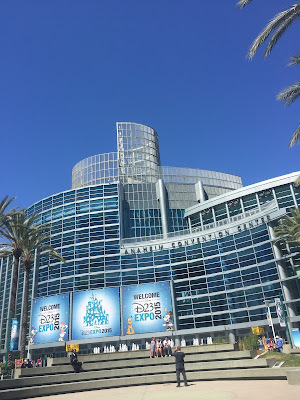 Anaheim Convention Center for D23! This year I was able to attend the D23 Expo in Anaheim, which is the huge convention for all things Disney related. I've never actually been to D23, so I was excited to see everything for the first time. Since this was my first time at D23, I didn't really have much of a game plan (except for my cosplays for each day, hehe). I had some panels in mind that I wanted to see on day one, but I actually wasn't able to attend any of them except the huge Disney Animation/Pixar panel. I met a couple of my friends in line around 8:15 in the morning, but we weren't actually admitted into the convention center until three hours later around 11:15. It was rather chaotic and we were basically melting in the sun, but it wasn't too big of a deal. We forgot all about it after walking onto the main floor and witnessing all the booths and displays for everything any Disney fan could possibly desire. The first booth we visited was the display for Shanghai Disneyland. It was really neat seeing the concept art, construction photos and videos for all the new and upcoming attractions for Disney's future theme park. I'm particularly excited to see how the new Pirates attraction, Tron Lightcycle roller coaster, and Soarin Over the Horizon turn out once the park opens. We wandered around the show floor for a bit, but we couldn't really focus on anything specifically for too long. We were starving, and all of the booths/exhibits were rather overwhelming. Some of the lines to get into certain merchandise stores were over three hours long! Props for Shanghai Disney's Pirates attraction! After we bought lunch at the Hilton, we decided to start waiting in line for the huge Disney Animation/Pixar panel. We only had to wait for a couple hours, which wasn't too bad compared to what we tackled the following day for the Live Action panel. I was extremely excited for the announcements because they were forcing us to stow away our phones, which hinted that they were going to show some extremely confidential footage or information about upcoming movies. I had no idea what to expect for the panel since it was my first time at D23, but as soon as the first video/introduction montage appeared on the screens, I was almost in tears. It was a simple montage of past and future Disney films, both animated and live action. The memories and emotions started pouring in during the video, and I was so excited to hear what they had in store for us. I won't get into too much detail on every single movie announced, but the movies they announced that I'm the most excited for are definitely Moana, Finding Dory, Zootopia, and Toy Story 4. I was a little skeptical about Toy Story 4 at first. I feel like I can speak for many fans and say that most of us were content and emotionally fulfilled from the last movie for the trilogy. However, John Lasseter revealed that the next movie was going to be about Woody and Bo Peep's love story...and everyone in the room nearly melted. It sounds like such a cute idea! I'm sure Pixar will knock it out of the park. Zootopia was a movie I wasn't quite sure about before experiencing the panel. After John Lasseter brought out Ginnifer Goodwin (one of my favorite actresses), as well as showed exclusive D23 clips from the movie, I can tell this is going to be an incredibly clever and wonderful film! I'm so excited to see the finished product! Promotional photo for Finding Dory! Hands down the best surprise for the entire D23 weekend was seeing Ellen Degeneres live and in the flesh. I'm a huge Ellen fan -- I used to tape her show every day and watch with my mom whenever we had the time. During the Finding Dory presentation, it didn't even occur to me that she could very well walk onto that stage and grace us with her presence. Well....she did. I screamed some sort of a noise I never thought was humanely possible, but it was all so unreal. We were able to see the rest of the cast for the movie, which included some great stars such as Ty Burrell and Ed O'Neill from "Modern Family", as well as more exclusive clips exposing some of the story behind Dory trying to find her family. Despite the thrill I experienced seeing Ellen, I have to say the movie I'm most anticipated in seeing out of everything announced is Moana. Moana is the next Disney princess movie, scheduled to release late 2016. Set 2,000 years ago in the islands of the South Pacific, this movie is going to have absolutely stunning animation, gorgeous music, and I think a beautiful story. We were able to see a few clips from the film, as well as learn more about another character named Maui, a demi-god played by Dwayne Johnson (who joined the panel on stage during the presentation). We were able to see a live performance of one of the songs from the upcoming movie, and I was almost in tears watching the sneak peek clip of baby Moana discovering the ocean for the first time. Everything about this movie reminded me of both working at the Polynesian Resort and my mother. My mom hula dances and loves Polynesian music, and we were able to visit Aulani in Hawaii earlier this summer. I absolutely cannot wait until this movie is released in theaters. The animation announcements concluded with a live performance from none other than the legendary Randy Newman singing "You've Got a Friend in Me" with all the Toy Story characters on stage dancing around and singing along. By the time the panel was finished, the Expo had concluded for the evening, ending day one. After experiencing everything that had happened during the first day, I was incredibly motivated for the next morning's panel: Live Action. I plan on writing separate posts about my DisneyBounds and cosplays from D23 Expo, explaining where I found and bought each article of clothing to help put each outfit together. Stay tuned! Sara came to visit me in Disneyland for the first time in almost two years! 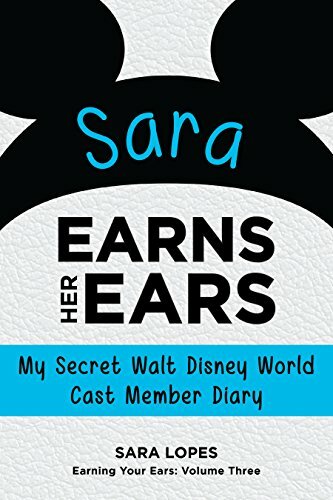 It was actually pretty crowded in the parks, so we did everything Sara's never tried in Disneyland before! We were also able to see each of the new shows offered in the parks for Disneyland's 60th anniversary celebration, such as the new fireworks and Paint the Night parade!